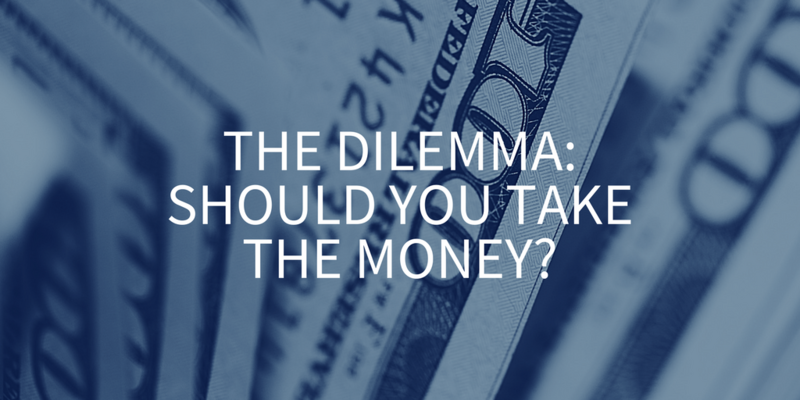 The dilemma: should you take the money? Recently I had a conversation with two partners who have a fantastic idea that they’ve been working on getting to market, but they’re now at an impasse. One partner wants to take money to fund the business. They feel like the risk in the business is quite significant – they’ve invested a lot of time and money but aren’t cash flow neutral yet. The other partner is looking forward and believes that they will be cash flow neutral in the next 12 months so they want to keep bootstrapping. They were trying to decide whether to take money from VCs or to continue bootstrapping so they asked me for my advice. This is what I told them. The job of a VC is to put in place structures to ensure that your great idea grows, gets to market and has a huge exit. There’s an almost Icarus effect when you take funding – VCs want you to fly as quickly and as high as you can. They don’t care who gets burnt in the process as long as you grow a billion-dollar business. If your business is only marginally successful or it becomes apparent that you don’t have the potential to be a billion-dollar business, the VC doesn’t care about your potential. This can have terrible consequences for founders because they may have a business that can be profitable, yet they end up with nothing – no control, no equity and no business. The two partners I was speaking to believed they were about 12 months away from having full control of a profitable business, so I told them they’d be mad to take the money. Next year they could have full control of a profitable business or be in partial control of a business that has its destiny in someone else’s hands. The decision for me is simple. There are some situations where taking the money may make sense – if you’re an entrepreneur with great ideas but you don’t want to build a business, for example. By taking funding you’re willing to let someone else build the business for you. But if you really want to build a business, then funding is not something you should consider, particularly in the early stages. Just because you don’t take funding doesn’t mean you can’t grow just as large as some of your competitors either. Several vendors in the BI space have taken $100 to $150 million to grow their business, yet Yellowfin has outperformed them organically. We’ve worked hard and built a sustainable and successful business. Despite all the funding, we’re yet to see any significant giants in the BI space, but we’ve certainly seen several carcasses along the way. If you’re building a business that you want to be in control of and you believe you’re the right person to build that business, then I strongly encourage you to take the pain. Work twice as hard, take bigger risks and own your business for as long as you can because the rewards are infinitely greater. If you really can’t do it yourself then at least hold onto your business for as long as you can before you take funding. That way you can ensure that you only give away a small minority stake rather than giving away everything you’ve worked so hard for.